** It's been a quiet week around Panel Patter as we recover from our SPX and Rose City Comic Con festivities, both in person and our coverage leading up to the show. We hope that everyone had a great time at those shows and we should be back next week to something looking like our regular publishing schedule. ** As long as it's a slow week, let's remind you of some ways that you can follow Panel Patter. Or if you're not up on your social networks, you follow us via an RSS newsreader or even email. ** The list of Ignatz award winners is pretty great, isn't it? ** September 27th through October 2nd is Banned Book Week. You can follow the Comic Book Legal Defence Fund to see the many ways that comics are challenged. This year, we've seen people try to get books like Palomar and Fun Home dropped from libraries and college reading lists. The CBLDF has even put together a book about ways to help celebrate this week and fight these calls for banning and censorship. There are two comics on this list-- Marjane Satrapi's Persepolis and Raina Telgemeier's Drama. Both comics are about unique experiences and offer a wider view of the world than "safer" fiction could. Drama is challenged for its LGBQT themes while Persepolis is questioned because of its profanity, violent content and religious viewpoint. Looking at the CBLDF Handbook, there are a number of reasons that books get challenged. Even classic comics like Bone are listed as being challenged for a number of reasons. So next week, celebrate the myriad wealth of comics and go and read a banned or challenged comic. I know some of us around here will be doing that. ** There's also a pretty cool Humble Bundle book set that's been put together for Banned Book Week that supports the CBLDF and all of the work that they do. 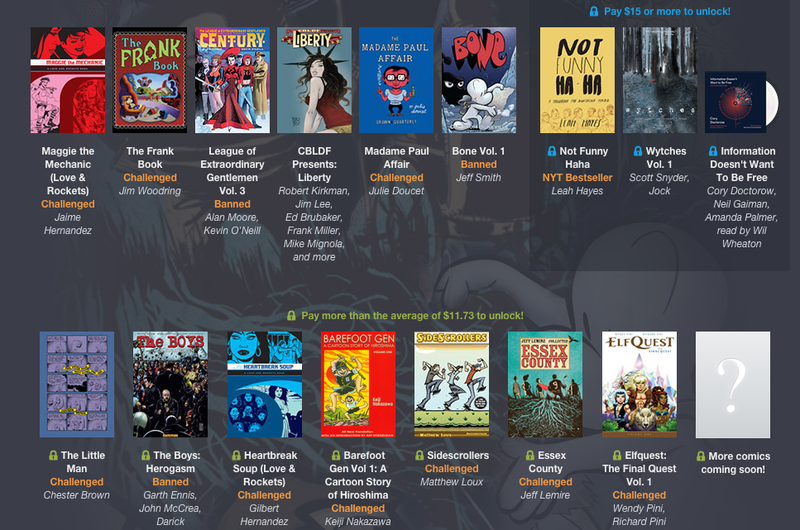 This bundle, as well as supporting a great cause, features some really good and diverse books. It's worth getting if you've never read any Jim Woodring or Chester Brown. And if you only know Jeff Lemire from his DC and Marvel work, definitely pay the bit extra to get Essex County.